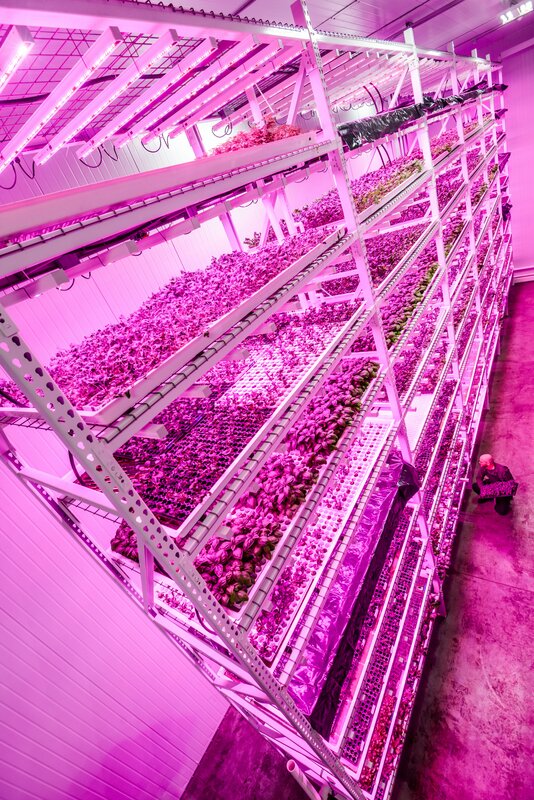 Somerset, NJ – Royal Philips (NYSE: PHG AEX: PHIA), the global leader in lighting, has partnered with Green Sense Farms (GSF), a Chicago-area commercial grower, to develop one of the largest indoor commercial farms using LED grow lights tailored to their specific crops. This innovative farming model allows them to harvest 20-25 times a year by using ‘light recipes’ optimized for their produce, using 85 percent less energy. The result will be an increase in crop yields and reduced operating costs, while providing consumers with locally grown, fresh vegetables throughout the year. The United Nations (UN) predicts the world’s population will grow by some 2.5 billion people by 2050, and 80 percent of the world’s population will live in cities. At the same time, 80 percent of the land that is suitable for growing food is already in use. Moreover, extreme weather patterns across the globe have devastated crops, creating higher food prices, and as consumers become more conscious of how their food is produced, it is becoming more difficult for farmers to keep up with urban growth. 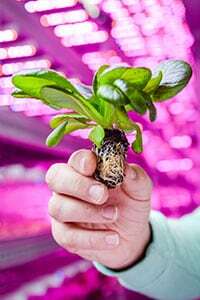 This is driving innovation of new farming technologies that allow plants to grow without sunlight in indoor environments close to or within cities. Plants’ sensitivity to light is very different from the human eye, so plants use certain wavelengths of light more efficiently and respond in a different way to different sets of wavelengths. 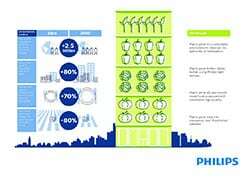 Philips has a keen understanding of this phenomenon having been active in horticultural lighting since 1936, but the advent of LED technology has enabled the fine tuning of tailor-made light recipes optimized to the needs of specific crops. Working with research institutes, universities, growers and partners like Hort Americas, who supported the installation of the GSF project, Philips is able to meet a grower’s unique needs. Also, because LEDs run at cooler temperatures they can be placed closer to the plants and optimally positioned, ensuring complete uniform illumination of the plant. "Different plant types have different light needs and working with forward thinking growers like GSF, Philips is building up a database of ‘light recipes’ for different plant varieties," said Udo van Slooten, Director of horticultural lighting at Philips. "GSF is using vertical hydroponic technology with Phillips LED growing lights, enabling them to do what no other grower can do: provide a consistent amount of high quality produce, year round. As the leader in lighting, it is important for us to use lighting in new and innovative ways that better serve the communities in which we live, work, and play." GSF has invested millions of dollars to renovate and equip a million cubic foot indoor growing area consisting of fourteen 25 foot tall growing towers in two climate-controlled grow rooms, which use Philips energy-efficient LED solutions tailored to their specific crops. This method also eliminates the need for harmful pesticides, fertilizers or preservatives, resulting in produce that is organically grown and virtually chemical free. 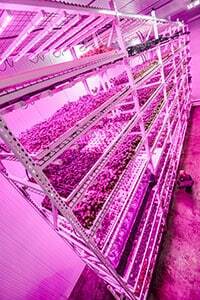 "Through our joint R&D efforts with Philips, we continue to innovate and perfect LED lighting for indoor growing systems that can maximize plant photosynthesis, while minimizing energy use for the most delicious and nutritious vegetables grown in a sustainable manner," said Robert Colangelo, founding farmer/president of Green Sense Farms. "By growing our crops vertically, we are able to pack more plants per acre than we would have in a field farm, which results in more harvests per year. We produce little waste, no agricultural runoff and minimal greenhouse gasses because the food is grown where it is consumed." GSF’s vision is to build farms at institutions, such as college campuses, hospital complexes and military bases that can serve large worker populations, reducing the miles their food travels and improving freshness. Green Sense Farms. LLC based in Portage, Indiana is a privately held concern that employs a sustainable approach to farming. Providing consumers with organically grown pesticide/ herbicide and GMO free produce is good for people and the planet. Conserving resources is also good for our bottom line. Everything that can be recycled, is, including water and nutrients. Produce is harvested 365 days a year with the goal- farm to table in 24 hours.